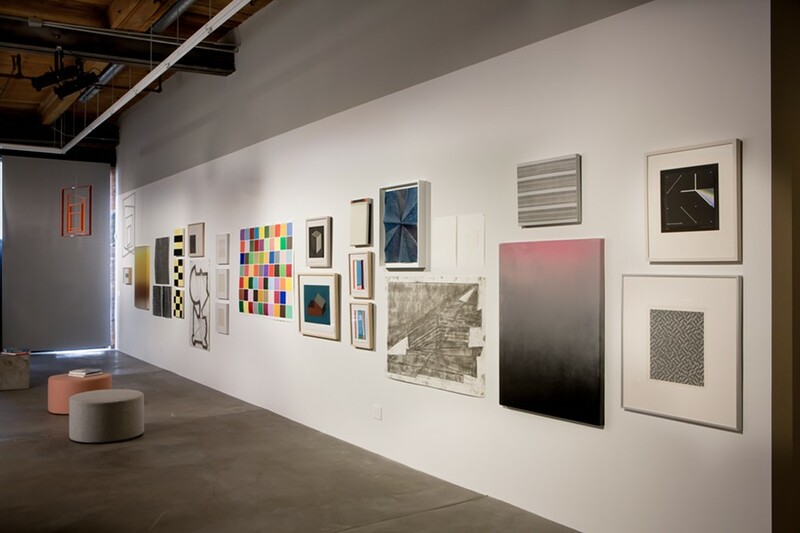 PHOTO COURTESY DEBORAH RONNEN FINE ART Installation view of "Minimal Mostly" at R1 Studios, which includes work by Sol Lewitt, Spencer Fish, Mika Tajima, Frank Stella, Amanda Means, and others. There's an oft-repeated joke, in comics and conversation, concerning various genres in modern art. One viewer bitterly moans or mutters, "I could do that," usually with a dismissive eye roll. Then comes the snappy rejoinder from a friend: "Sure, but you didn't." I've heard this one uttered more than once while taking in an abstract or minimalist exhibit, but clichés always contain a measure of truth. It takes a certain level of skill and vision to dwell deeply upon simple things; to create something that seems obvious, but isn't, that's so perfectly unassuming it's also unpredictably moving. Minimalism is versatile -- it can provide an unobtrusive backdrop while also functioning as a subtly-engaging mental puzzle, and it can be a bold, statement-making, conversation-starting centerpiece to any space. The many sides of Minimalism are represented in "Minimal Mostly," the newest exhibit curated by art collector and dealer Deborah Ronnen. 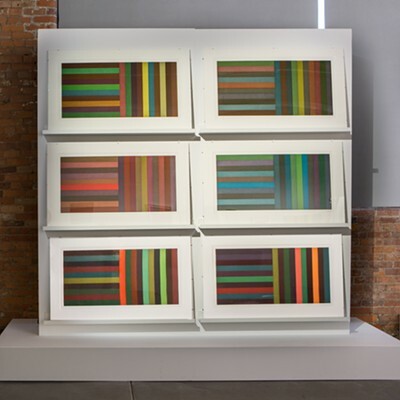 The educational show presents the work of such pillars as Ellsworth Kelly, Sol LeWitt, Josef and Anni Albers, and Frank Stella, alongside that of lesser-known and working artists who are making noteworthy contributions to the genre's legacy. "The show provides an opportunity to let people study the work," Ronnen says. 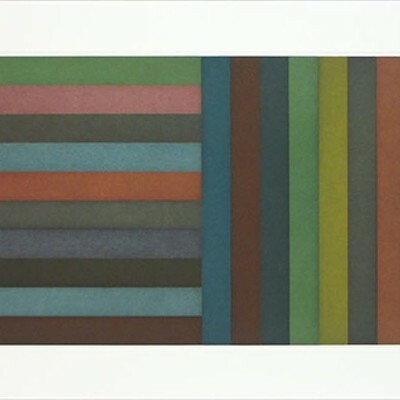 Among the minimalist masterworks are Lewitt's 1991 suite of experimental etchings with aquatint, "Horizontal Color Bands and Vertical Color Bands," which will mesmerize anyone with the slightest fixation on the wonders of color theory. Ronnen has also provided a number of books on the represented artists' work for extended reference. One of these tomes is dedicated to Lewitt's oeuvre of wall drawings, which are large-scale murals of geometric forms made from parallel bands of lines. 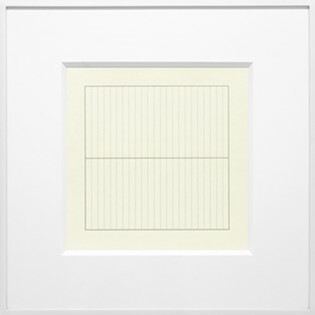 Lewitt's individual ideas for the wall drawings were sold to buyers who, in the beginning, would execute the drawing themselves according to hyper-specific instructions. Later, the drawings would be installed by a team of people trained in Lewitt's studio. If the owner moved, they could sell the idea or paint over the mural, then have the team come reinstall it elsewhere. 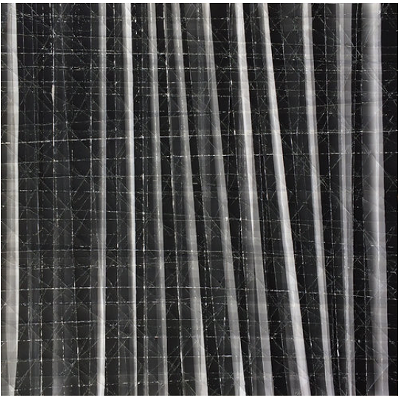 Included in the slightly more representational of the older works is Reuven Berman Kadim's 1975 screenprint, "Constellation," with its calming connect-the-dots, grid view of the cosmos and breakout spectrum flare. 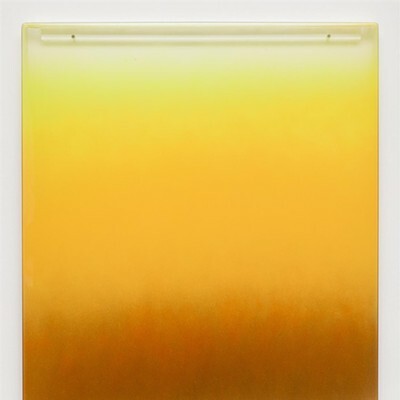 In order to explore the legacy of Minimalism in contemporary work, Ronnen says she "looked for younger artists who so clearly have been influenced by them, but have also developed their own personal statement." Hanging high up, toward the front of the space is Jose Dávila's "Homage to the Square," a mobile of concentric metal frames painted with bright orange enamel. Suspended through their centers by a single wire, the squares gently rotate in a kinetic nod to Albers. Carmelle Safdie, Ronnen's step-granddaughter, is a painter who also works in other media and is an Albers scholar. 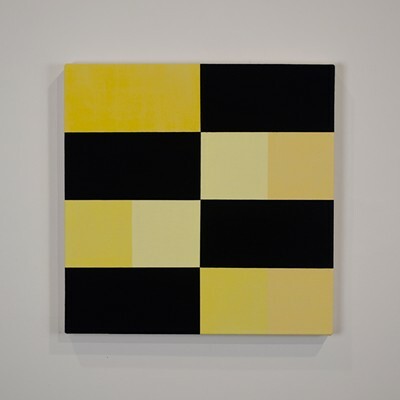 Her three works in the show, from her "Program" series, combine bands and squares of matte black Flashe paint with phosphorescent paint in various yellow hues, from buttery to mustard. Ronnen turned the lights out so that we could better appreciate the ethereal quality of the work, which has the interesting visual effect of seeming like you're looking at both the image and its afterimage at the same time. Each work in Mika Tajima's "Furniture Art" series presents a flowing spectrum of enamel finely sprayed on the inside of wall-mounted, transparent acrylic boxes. The see-through quality of the work means that its appearance is altered by whatever surface it's hung upon. Ronnen says that "Furniture Art" is a reference to French composer Erik Satie's "Furniture Music," a satirical genre that wasn't meant to be listened to intently, but as a background to other, often mundane events. Gabriel de la Mora's simple, subtle "CI/201" is made up of three stacks of microscope slides embedded within a white mat board. As light passes through the irregular sides of the pale green glass bands, it creates a tiny world of complex, rippling shadows against the back mounting board. 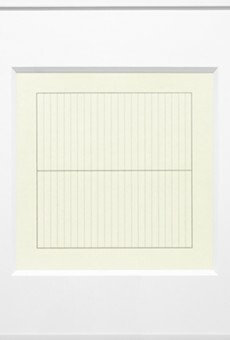 The work of Agnes Martin is arguably the most stripped-down, purest, and most orderly in the show. Her screenprints, from a series called "On a Clear Day," read like a piece of lined paper, a musical staff, or charts, and function as a resting place or a starting place for the fertile mind of viewers. Within one of Ronnen's collection of books in the gallery, interested viewers can also check out Martin's sublime paintings of floating pastel bands. In some ways, this is a highly process-oriented show. For example, the illusion of textile-texture in Amanda Means' photo-based series, "Folded and Crushed," is achieved by folding and crinkling silver gelatin prints. 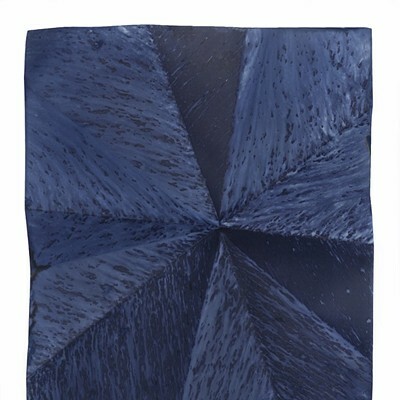 And the topographic-like markings on Meghann Riepenhoff's large, dynamic cyanotypes are achieved when she folds or otherwise alters the shapes of large sheets of photo-sensitive paper and exposes them not only to light, but the elements. Ronnen has collaborated with various institutions to organize a series of related events during the run of "Minimal Mostly," including a lecture, film screenings, and a night of poetry. For more information, visit minimalmostly.com.